An ethereal illustration of watercolor roses in pink creates the peaceful nature of these beautiful ethereal garden wedding invitations. Real foil accents in your choice of three colors add shimmer and shine to the floral bouquet. 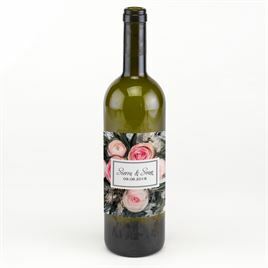 A matching floral design appears on the back with your names. Looking for different wording options? 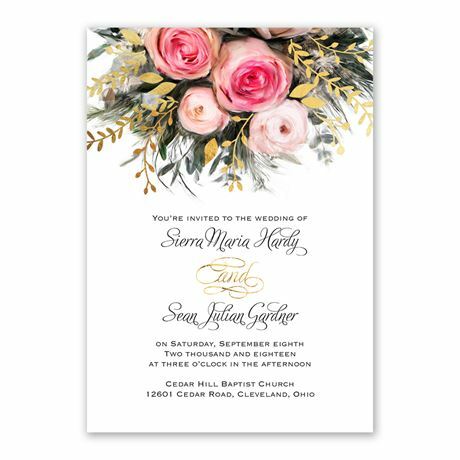 Check out Ethereal Garden with Wording Options for the same invitation without "and" printed in foil between your names. Personalization Options: Floral design prints as shown. Foil accents print in your choice of three foil colors. Your wording is printed in your choice of colors and fonts. I recently bought wedding invitations and when I received them I noticed the font was no right. Called Dawns and the customer Service was very help full and agreed the size was off. When I asked about exchanging them, I was told I should have noticed the size when I previewed before ordering because they do not take back product. I explained to her the size did not look like that when I previewed the order and there is NO way to change the font size on the design tab. To get replacements they wanted 60% of what I originally paid. I would suggest before ordering from Dawns buy a $0.99 sample. I was extremely picky when picking out invitations and this is exactly what I wanted! They are exactly what they look like online. The standard paper is nice and smooth, the foil pops and is a beautiful accent, the font options and colours were perfect. Not to mention delivery was speedy! All in all a great experience. I would highly recommend ! I love bling, and when I decided to change from a glam wedding to a boho chic wedding this was the invitation I wanted. I saw it for the first time and I knew it was going to be this one. The service from Invitations by Dawn has been great. No one in Dominican Republic will have such wonderful invites. The foil on this invitation was a great pop of shine for our elegant wedding! We received so many compliments on our wedding invitations. I will recommend Invitations by Dawn to all my friends and family! I can't express how much I love my wedding invitations. I was having the hardest time finding "the one" invite that made my heart flutter when I saw it. I had been to hundreds of websites and was pretty upset when I thought I was just going to have to settle, but then I came across these invites and immediately fell in love. The foil adds the perfect touch as well. Customer service was great to work with! I realized 2 hrs after I had placed the order that I had transposed the venue's address. They fixed it immediately I definitely recommend both the company and the product!